Thank you, Phil Daniels – For the fainthearted . . .
Charlie Thursday had a familiar look about him. Not from recent television appearances, but from a moment long past. A search of the Radio Times website revealed that Inspector Thursday’s brother in tonight’s episode of Endeavour was being played by Phil Daniels. I remember Phil Daniels, he was Danny in the film Breaking Glass. Going to the London School of Economics in October 1979, after two terms, I dropped out. The university administration was very gracious, and gave me a year off. The summer of 1980 was spent in nothingness, by September I had to do something and found a post through an organisation called Community Service Volunteers. The voluntary post came with board and lodge and £10 a week pocket money. My housemates were preparing to be monks; there was no television in the gate lodge in which we lived; no radio, and only an elderly portable record player on which to play the handful of old LPs they had. Their conversation was often esoteric religious stuff; not much in it to interest one approaching his 20th birthday with no religious background. The best moments were when they got their Woodstock records out and talked of times when it seemed that the world could have been a good place. It was a frequently lonely. The pocket money didn’t go far, not that there was much to spend the money on; a pint at the local pub and occasional visits to the cinema to see things that were even half interesting. Sometimes the dark shadows of depression would close in and the whole experience would seem like an odd play in which I was no more than an onlooker. Slowly I began to buy odd records of my own. These were greeted with scorn and derision by my housemates; I still laugh at memories of them singing their own words to Blondie’s Atomic. They were good blokes; just from a generation before the rough-edgedness of punk. 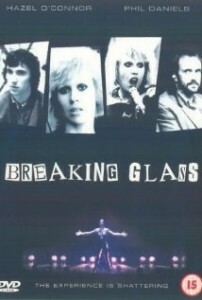 One film and record got me through, Breaking Glass in which Phil Daniels played Danny alongside Hazel O’Connor who played the rock star, Kate. The film tracked the meteoric rise and fall of the fictional rock star. Her fall comes with deep depression, and the angst and melancholy of the music express the pain of being unable to communicate from behind a wall of darkness – and Danny being there, getting things wrong, but being there at the end. The film was shown at the cinema and I bought the album at a record shop. I played it, again and again. The lyrics still come back with little attempt at recall – Breaking Glass got me though. Googling Phil Daniels reveals him to be only two years my senior; he had a worldly wisdom at twenty-one years old that took me decades to attain. He will never know how much he and Hazel O’Connor meant to a lonely nineteen year old. Hazel is playing at the McMillan Theatre in Bridgwater on 4th March!